What Do Gamers Really Want in A Monitor? Gamers are among the most demanding computer users there are. Aside from the fact that they’re usually some of the most power-heavy users around, their computer needs may also vary from person to person. There’s no set build for everyone. Even their monitor needs vary from speed, size, refresh rate, and resolution depending on their preferred games. For example, some games like Left4Dead or DotA2, don’t require too high computer specs for a lag-free game, while others, like Crysis or Doom, require high specs if you want to have an enjoyable gaming experience. If you’re a gamer interested in finding a monitor that can suit your all-around needs, and more specifically your gaming needs, then read on! Speed is mainly determined by the CPU, which is why many gamers splurge to afford a good and speedy gaming rig. Your monitor does have some effect on your computer’s speed, though. If your CPU is speedy enough, you won’t see much difference with a fast monitor speed, but you’re definitely going to notice something with a slow monitor speed. One important thing to keep in mind though is to make sure that your system can actually support your other hardware. If your monitor speed is fast but your system itself is not, your computer will still show some noticeable slowing. Size also holds importance when you’re choosing a gaming set, especially if we’re talking about monitors. You don’t want something so big that you won’t be able to see everything on screen with one glance, and at the same time, you don’t want something so small that you won’t be able to appreciate all the details of your game. Many of the best buy monitors, especially for gamers, are around 24-28 inches in size. Anything in this range is considered to be the perfect and most comfortable size for gamers. Monitor sizes are pretty much nothing when you don’t consider screen resolutions. Screen resolution refers to the number of pixels on your screen. You can have a 24” monitor with a 1366×760 resolution and it’s still going to look horrible! If you’ve ever seen a small image blown up, then you’ve seen exactly what a low-resolution image will look like on a big screen. Of course, as a gamer, you wouldn’t want that. For the best results, opt for something equal to or higher than 1920×1080. You can always go higher if you want more crisp and detailed images. 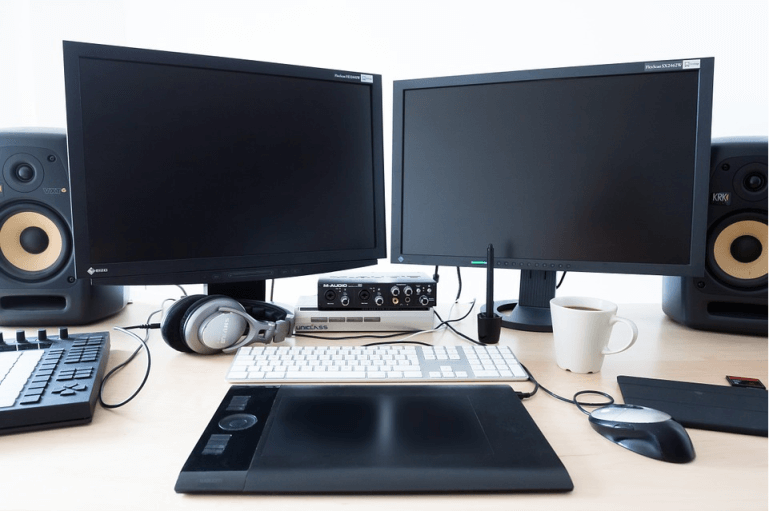 When it comes to the relationship between monitor size and resolution, there’s another important factor that you have to consider: aspect ratio. Aspect ratio refers to the ratio between the width and height of your computer’s screen. Gaming monitors generally have a widescreen or 16:9 aspect ratio. Why? Simply put, a widescreen has the ability to show more information on the screen, be it useful game data, gaming stats, or even just the in-game world itself. As a gamer, you probably understand how much this helps your gaming experience. Not only does it allow you to play more accurately, it also helps you enjoy the in-game environment more. Refresh rate is what you call the rate of how fast the image on your screen refreshes. These rates are measured by hertz or Hz. Most of the time, refresh rates range from 60Hz to 85Hz. Anything less than 60Hz is may cause some noticeable flickering on your screen. Obviously, this flickering can be tiring for your eyes, which is a no-no if you’re getting ready for a long gaming session. Also, for gamers, it’s important that this number is high enough to avoid laggy games and to have a smoother gameplay. Some monitors even support refresh rates up to 100Hz. Typically, lower resolutions support higher refresh rates, but this means that you’d have to decide between image quality and speed. These are just some things that you would have to consider when choosing a computer monitor for your gaming needs. Remember, monitors aren’t everything, though! You may have the best buy monitor, but if the rest of your system isn’t up to par, then your gaming experience may still be negatively affected. For the best results, make sure to choose your gaming build wisely!